For many prisoners, the Christmas season is incredibly difficult. Many have little to no contact with the outside world and no family to speak of. Something as simple as a Christmas card in the mail is a life-giving reminder for a prisoner that he or she is not forgotten. 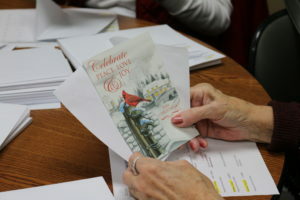 So every year, Crossroads Prison Ministries collects Christmas cards to send to men and women in prison across the country. For many Crossroads students, they are the only cards they receive all year. 2. You may add a special greeting, encouragement or Bible verse. 3. Sign the card with your first name only. Please do not send unsigned cards. 4. Place the card in its blank envelope. Do not seal or put a postage stamp on the envelope. Crossroads will personalize the envelope with a student’s name and include it with their lesson. 5. Mail the card(s) with the blank envelope(s) to Crossroads by November 15, 2018. Please feel free to send more than one card—or even an entire box! 1. Each card must fit into a 6″ by 9″ envelope. 2. Because most correctional facilities have strict guidelines, please do not include cards or envelopes with foil, stickers, glitter, glue, pop-up parts or paint, and do not send homemade layered cards. 3. Please write your message in blue or black ink so we can adhere to prison regulations.